My evil cat's favorite game is Throw Stuffed Animals Down The Long Hallway. In this game, my wind resistant cat will run across our apartment and down a hallway as fast as a freaking cheetah to capture a thrown stuffed animal. He may leap up into the air. He may actually catch the animal. He may not move at all, and instead snidely stare at me as the poor animal I just threw plops on the ground with no one to attack it. The one thing he will for sure not do is return the stuffed animal it to the person that threw it. 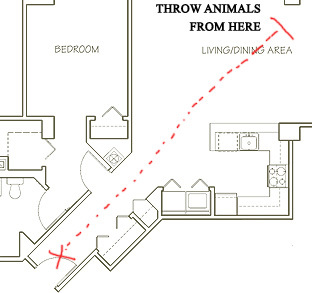 Because my cat is mean and doesn't fetch, I have to manually retrieve the animals I throw down the hall for him. Needless to say, he has a lot of toys. That way, I can minimize my energy output by having to retrieve these stuffed animals less frequently. I grab a handful of toys, stand in one spot, and throw them down the hall. Then I run to the end where all the animals have been collecting, and throw the animals back up the hallway. It's a viscous cycle that my evil crack baby never wants to end. hahahah oh my god, why are cats so EVIL! We have one cat that will fetch plastic ties from food cartons, for hours on end. Hours. When she decides the game is no longer worth her time she takes the tie and drops it in the toilet. yay. 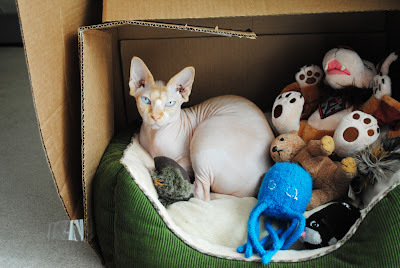 I think he doesn't bring the toys back to you because he doesn't want you confuse him with a dog. That would just be humiliating! Too funny! I loves it! My evil fe-lion does in fact fetch...and though this makes said game easier...he also likes to play at 3 am in the morning or any time that suits him. He meows and meows with the toy in his mouth still...until I wake up. He's a gem I tell you!